those of you out there in www land who know me know that i’m not a huge fan of christmas. you can call me scrooge or any other thing, no matter what you do or say, that’s just the way frank is. i see no point in decorating, hate the fact that the house will be rearranged for three weeks out of the year… and the list goes on. 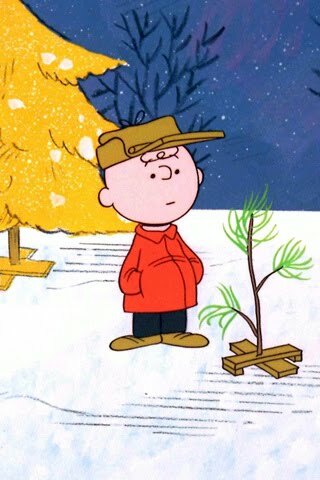 if there is one thing that can melt my icy anti-christmas disposition it’s the charlie brown christmas special. that’s pretty much the only thing. with the advent of video, dvd and streaming web video, i could essentially watch the special whenever i wanted. i could watch it in a t-shirt and jeans in june if the wind struck me. but i resist. many times i’ve had the dvd in my hand, only to put it down and walk away. why would i hold something so special to me in my hand, with only $9.95 and adrive home standing in between me and it? some of my older readers may remember the annual ritual of CBS’ broadcast of the WIZARD OF OZ. it was the one time of year you could see it. of course, when i was a kid, there were only 13 channels of basic cable. it was an event. you prepared for it, waited eagerly for it and when it was on, you were transfixed onto dorothy and the gang for nearly three hours. those times are long gone. long, long gone. as i am on the uphill side of my 30’s i relish in those forgotten, took for granted moments. the eagerness, the magic of a seemingly insignificant occurance. 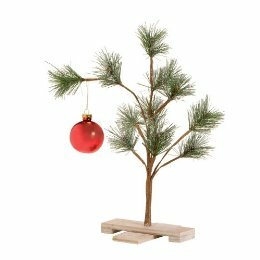 so i prepare every year for the charlie brown christmas special… it’s my thing…my tradition. i’ve watched it 30 times in my life, once a year since i was 4 years old. and each time it becomes more and more special to me. i prefer to watch it by myself. just me, the couch and the gang. i was stunned. instantaneously, i went from “when the hell are we leaving” to”where the hell are those trees…” i wanted one. BAD. i broke away from her and set out on my quest. an aisle away… there it was. take the past tense literally. the place where the trees WERE on the shelf was as empty as my soda can. my heart sank. i sulked back to lezley who, breaking into mother mode said, “oh, we’re asking if there’s more…” she grabbed a sales representative and asked. the rep got on her headset. i’m not sure who she was talking to or where that thing connected. in true charlie brown fashion it seems as though i got there at the wrong place and time… not by hours, not by minutes…but by freakin’ microseconds. apparently the precise moment we walked in, there were three trees available. seconds later, two were in one customer’s cart and the other was the one lezley saw in that dude’s hand. i momentarily plotted a parking lot charlie brown tree kidnapping. fortuantely, my plan had holes in it so i scrapped it. the dude who had the last one looked like he could fight. i can only run. lucy pulled that football right out from under my kick. i felt like ol’ chuck. but the one thing charlie brown didn’t have that i do is the internet. i got home, scanned the web, found another store that carried them and shot across town to get one. at first, i didn’t want to take it out of the box. would that specialness go away? would that feeling i get, the mixture of sadness and joy sprinkled with tears become tainted? so, for the first time in my life, i own a christmas tree. i love this tree. it’s so sad and yet, so uplifting at the same time. you see hope in the tree, in the reflection on that single red bulb. the tree may bend, it may lose its needles, but it’ll never break. no matter what, that tree will stand long after everything else. you all know it’s not about the tree. but i still needed one. but, if you don’t want to go to the trouble of all that, you can continue to come to bobthesquirrel.com everyday for your dose of squirrel…i like the company and it’s only here you can find out when the latest bob books become available.